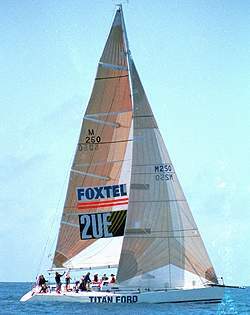 DIVISION IN THE "HAYMAN ISLAND BIG BOAT SERIES "IN 1998 . AND DOWN THE EAST COAST OF AUSTRALIA . 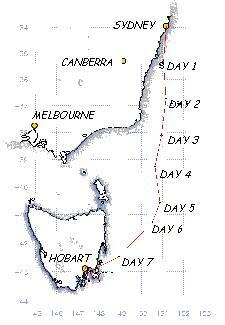 NORMAL CONDITIONS THIS WOULD BE A TOUGH AND GRUELLING RACE FOR ANY BOAT . THOUGH HE AND HIS YACHT MANAGED TO MAKE IT TO THE END . COMING IN 14TH OVERALL AND 3RD IN THE CHANNEL DIVISION . YACHT IT'S ALL A BIT OF A CHOOK RAFFLE . "BRINDABELLA" AND "AUSMAID" MAKING UP THE PLACES . THE . AUSTRALIANS . THIS IS NOT A SPORT FOR THE FAINT HEARTED . ON WHAT THE RACE WAS TRULY LIKE . AS SOON AS I CAN I WILL ADD IT TO THIS PAGE .